NEW! LOS DUG DUG'S VIDEO CHANNEL! UNKNOWN EARLY DUG DUG'S 45 DISCOVERED! IMPORTANT NOTICE! No less than two (count 'em) profile pages for Los Dug Dug's have been created on the popular Myspace website. It should be noted that neither page was produced either by Armando Nava or Ray Brazen, and neither page is endorsed by either of us. In 1960 a seven-member rock and roll band known as Xippos Rock was formed by several high school kids in the city of Durango in the state of Durango. 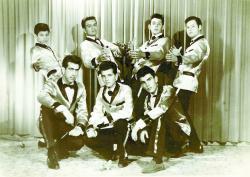 The group was led by singers Jorge de la Torre and Jorge Lujan. While making a name for themselves locally, Xippos Rock eventually welcomed Lujan's cousin, Armando Nava, into the group. Shortly afterward, the group altered its lineup, changed its name to Los Dug Dug's, and moved to Tijuana, and so began its rise to the top of the Mexican rock world. Now, over four decades later, Lujan and De La Torre have revived Xippos Rock with a new lineup including four of its original members (though not including Armando Nava). 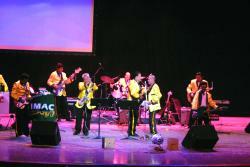 The newly reformed group played two shows in one night in Durango, Durango, on March 20, 2004. In an interesting twist, at both shows they shared the bill with the very band they evolved into, Los Dug Dug's themselves, who returned to Durango for the first time in two decades to be part of this event. "In January 2004, Jorge Lujan (a.k.a "Carcacho") arrived in Durango to meet with Jorge "La Borrega" de la Torre, and they started to locate all the members of Xippos Rock. On February 2, 2004, they finally met at the same table: Jorge Lujan, Jorge de la Torre, Roberto Miranda, Sergio Orrante and Juan Manuel Frias, an old musician nicknamed La Cocona ("Turkey"). Their first practice was on Wednesday, February 4, at which time they selected some songs to sing at the concert. Some days after, many other musicians auditioned for the group, including Pedro Guerra, a trumpet player who tried to play the piano; Pedro Aldaba, the best and most experienced bass player in Durango; Jose Luis "Pepe" Martïnez, the best guitar player in all the north of Mexico; and Miguel Ibarra, a sax player (and former member of Los Yaki). "As the day of the concert approached, a problem emerged. Pedro Guerra wasn't getting any better playing the piano. Carcacho and La Borrega were going crazy. Then I told them that I knew how to play the piano, so they invited me to play with them. I went to the practice, learned the songs, and became the new Xippos Rock member (they called me "Xippillo," or "Little Xippo"). "During the period while they were practicing, they contacted Armando Nava. At first, he didn't want to come, but when he heard his old friends on the telephone calling him by his nicknames ("Panfilo" and "Narizon" and sometimes "Tuburon"), he inmediately changed his mind. The day before the concert, Armando Nava arrived in Durango with the new Dug Dug's, Eduardo Gaona (keyboards), Javier "Pimpon" Salas (bass), and Salustio "Morton" Cruz (drums). "On Saturday, March 20, at 8:00 pm at Teatro Ricardo Castro, Pedro de la Garza introduced the Xippos Rock lineup, with Roberto Miranda (lead guitar), Jorge Lujan (rhythm guitar & vocals), Jorge de la Torre (lead vocals), Sergio Orrante (drums), and the new members of the Xippos: Miguel Ibarra and Mario Sax (saxophones), Pedro Aldaba (bass), Pedro Guerra (keyboards), Jose "Pepe" Martinez (rhythm guitar), and me, Oscar Amador Molina (lead keyboards). The songs that we played included "Rubrica (Xippos Rock Theme)," "Cuando Apenas Era un Jovencito," "Tus Ojos," and "Polvora," among other classic Mexican rock covers. "At 9:30 the Dug Dug's appeared. They played some covers of classic American and British rock before playing the songs that made Armando Nava world famous. "After the concert, the Xippos and the Dug Dug's played at a famous bar called 322. There the Dug's played first, then the Xippos put the crowd on their feet. That was the finish of a most glorious page of the history of Mexican rock." CLICK HERE FOR MORE DUG DUG'S NEWS! Dug Dug's live in Tlatelolco and more! SUPPORT MEXICAN ROCK ON THE WEB! From the creator of this site! From the pages of Mexican Rolling Stone! Much info plus the rarest photos anywhere! Amazing tribute to great 60s Mexican garage band! Mexico's king of the blues since 1958!